Lyme disease, a debilitating condition spread by ticks, has been on the rise in recent years, and new research now suggests that more Americans will experience the tick-borne illness in the future. Ticks that can carry Lyme disease are now found in almost half of U.S. counties, according to new research from the U.S. Centers for Disease Control (CDC). Lyme-carrying ticks were found in over 45% of U.S. counties, compared to only 30% of counties back in 1998. According to the CDC, there has also been a 320% increase in the number of Northeast counties now considered “high risk” for Lyme disease. The increase in the spread of these ticks may explain why cases of Lyme have been increasing. Cases of Lyme disease have tripled since the 1990s, with an estimated 300,000 Americans being diagnosed with the disease each year. Lyme disease is caused by Borrelia burgdorferi, a bacterium that is spread through tick bites. Lyme causes flu-like symptoms, including headaches, fevers, and fatigue. Usually, Lyme can be successfully treated using antibiotics. However, if the disease progresses, it can cause more serious symptoms, including debilitating fatigue, brain inflammation, and impaired memory. Lyme disease is more common in the Northeast, where there are a higher number of blacklegged ticks. Ticks are more common in areas with forests and rainfall, and are often spread by deer. Both reforestation and a rise in deer populations could explain some of the increase in the spread of ticks. However, these ticks were found to be spreading well beyond the Northeast. Virginia, Florida, and Georgia all saw a growing spread of ticks. Ohio, which was Lyme-tick free in 1996, now has 33 counties with Lyme-carrying ticks. “A lot of people are seeing ticks where they didn’t see them 20 years ago,” said Dr. Rebecca Eisen, a CDC research biologist. The spread of ticks is thought to be partially due to climate change, with ticks more likely to live in warmer, wetter climates than in drier desert areas. 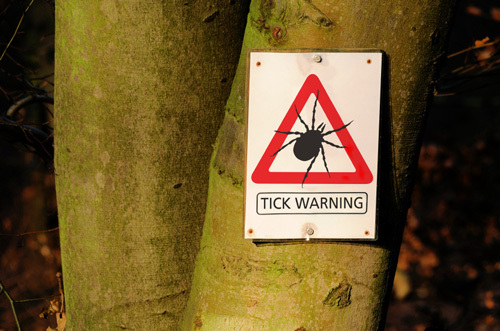 With this new research suggesting that the population of ticks is exploding, Dr. Eisen stresses the importance of taking preventative measures to keep from getting Lyme disease. These can include using insect repellants, staying out of forested areas, and taking showers after coming in from the outdoors. Pets can also get Lyme disease or carry the ticks into the home. It is recommended that dog owners check their dogs for ticks after taking them for walks, particularly in parks or wooded areas. While the findings of this latest research are troubling, most cases of Lyme disease can be cured with prompt treatment. If people believe they have been bitten by a tick or if they have a sudden onset of Lyme-like symptoms, it is important to seek medical attention. Asher, C., “Lyme disease-carrying ticks are now in half of all U.S. counties,” Science Magazine, January 18, 2016; http://www.sciencemag.org/news/2016/01/lyme-disease-carrying-ticks-are-now-half-all-us-counties.